Are you wondering how to configure the Record and Replay service? 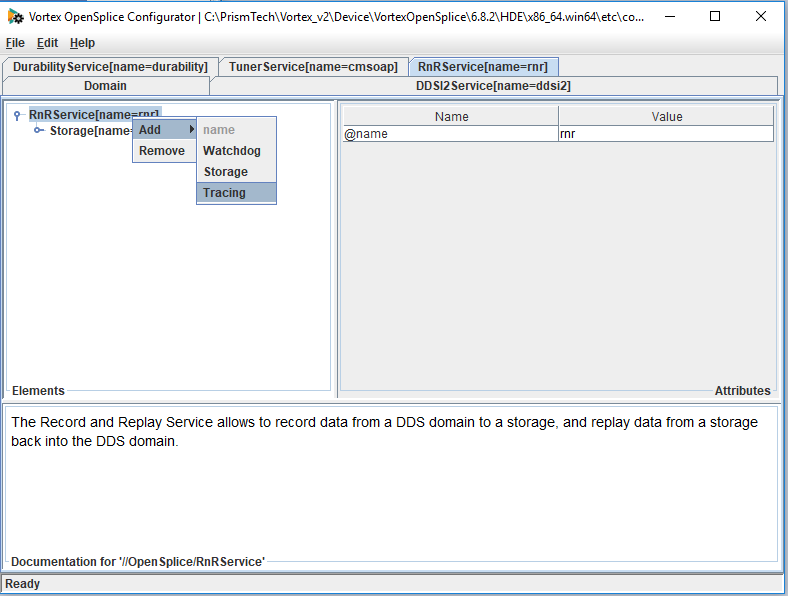 Record and Replay is a Vortex OpenSplice service that allows you to record dds data sets in the system. You can then replay these later. This allows you to analyse real-time performance and optimise it. You can also set up testing scenarios and query data. 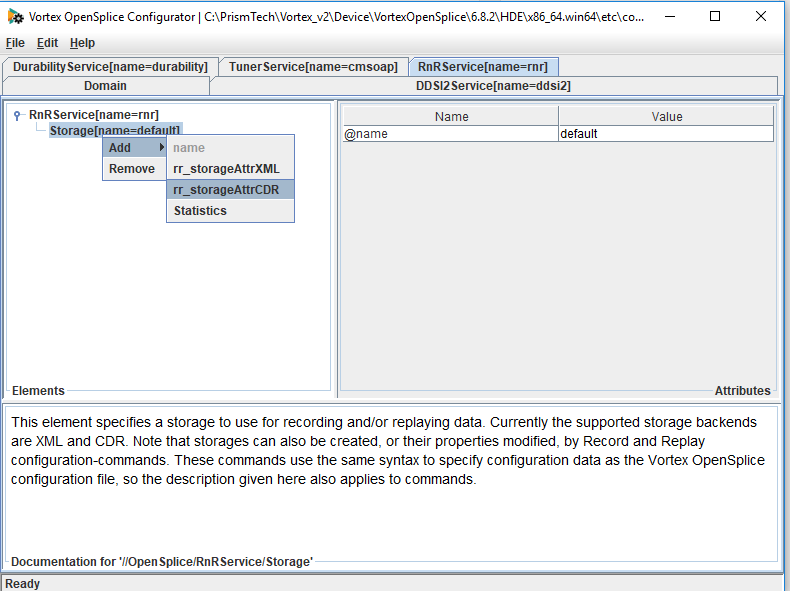 This tutorial shows you how to configure the Vortex OpenSplice Record and Replay (RnR) service . You need to have Vortex OpenSplice installed on your system. How do I configure the Record and Replay Service? in the Domain section of the xml configuration file that you are using. 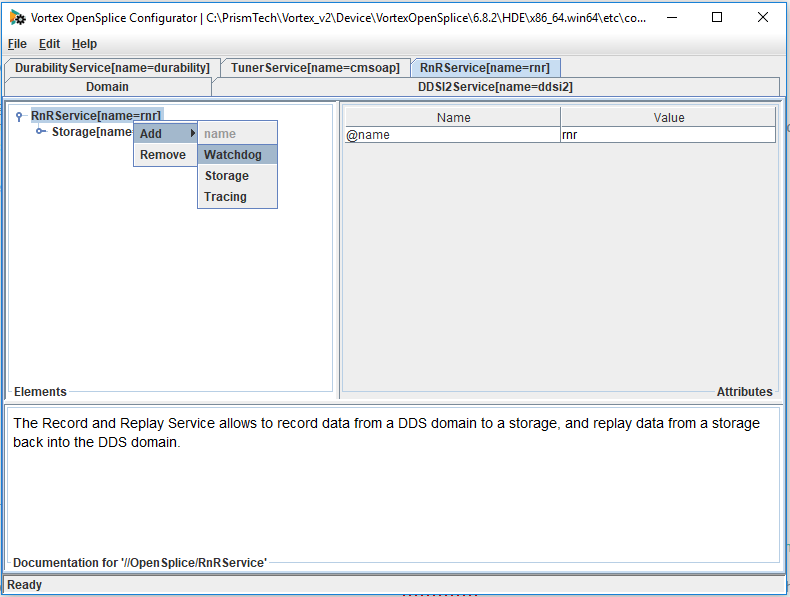 The name attribute specifies the name of the RnR service in the configuration. The default name is rnr. To add the configuration into the xml file it is advisable to use the OpenSplice configuration tool. Start the launcher tool and go to the tools button. In here click configuration and the the opslconf tool will start. You can also use the command “osplconf” on the command line. You need to configure your environment to use Vortex OpenSplice first. When the configuration tool appears, in the menu choose File -> Open and open the xml file you are using. Right click on the domain and choose Add -> Service ->RnR Service and click ok.
For the record and replay service to work it needs to have a name. Enter a name for the RnR service you are adding. The default name is rnr. After clicking ok it should appear in the list of services. 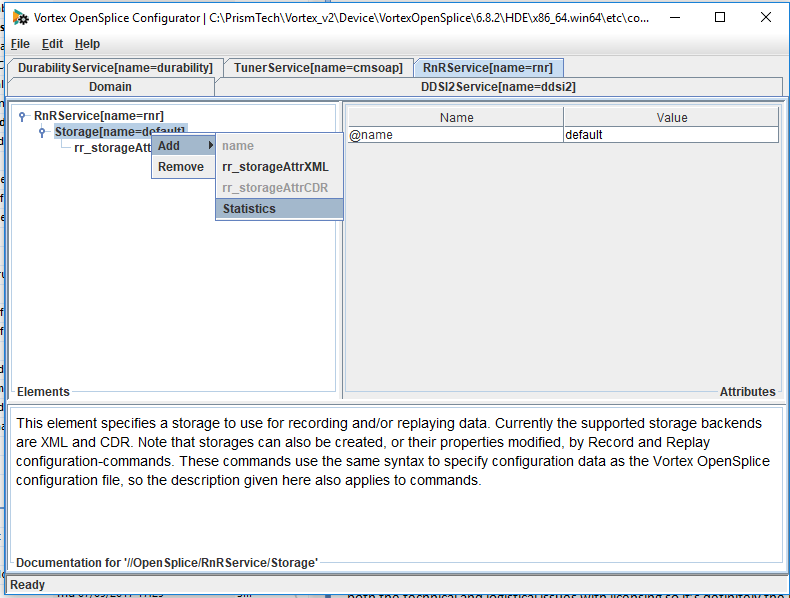 Versions before Vortex OpenSplice 6.4 only support xml storage. The advantage of xml storage is that the data is written in a human readable form. This allows you to edit the storage by hand. The disadvantage of xml storage is that it is less performant and the storage size is easily ten times larger than CDR. my-storage.dat – this contains the recorded samples. Each line is an XML record containing the sample user-data and internal data needed to replay the sample correctly. my-storage.dat.meta – contains the DDS type definitions of the recorded samples. When the samples are replayed the types are recreated by the service. These are also XML records. my-storage.dat.props – contains the properties of the storage eg the number of samples per topic. Please note that you should not open the xml files using an xml editor as this may corrupt the file. If you wish to open the file you should use the Record and Replay Manager tool to open and edit it. CDR storage is a binary storage format which is best suited to high thoughput and high volume data. Samples are serialised and deserialised using CDR. We recommend using CDR storage. my storage.data.props – contains the properties for the storage. There are two ways to add a storage file for RnR. Use the ConfigCommand in the API to add or modify the storage. A storage has a status topic that you can subscribe to. If you create a reader for this and do not receive data you know that no storage file exists. 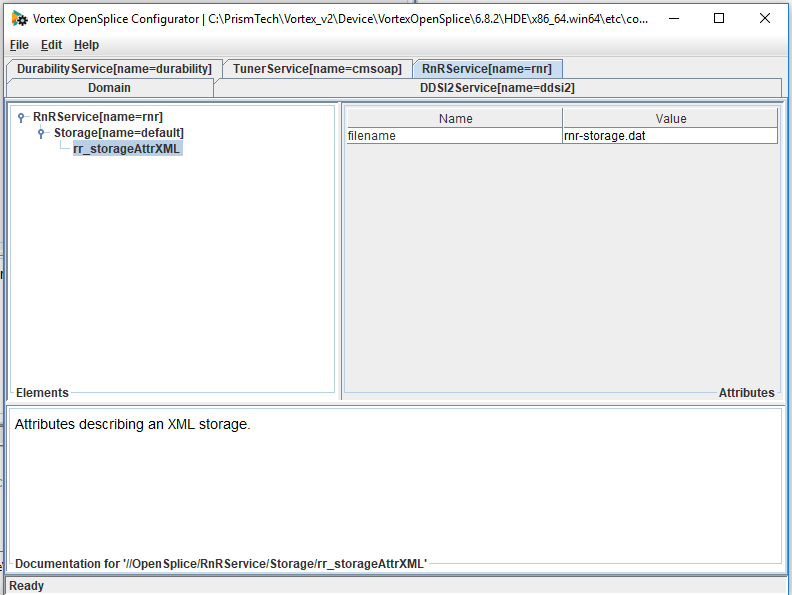 The storage is configured in the xml file in the OpenSplice/RnRService/Storage section. This section allows you to define sample stores where samples are recorded and replayed from. Each storage is identified by a unique name. You can also define other attributes in this section depending on the storage plugin. 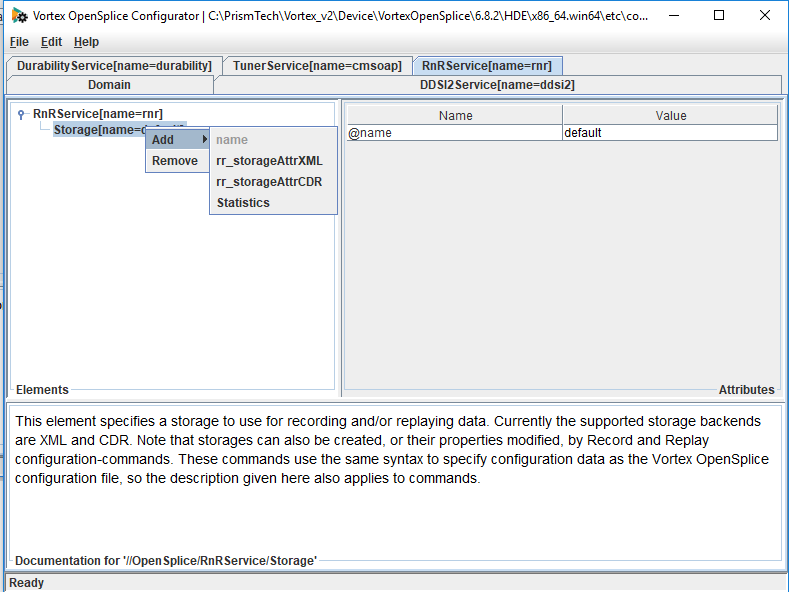 The xml file should be modified using the Vortex OpenSplice configuration tool. Start the launcher tool and go to the tools button. In here click on and configuration and the the opslconf tool will start. Alternatively you can use the command “osplconf” on the command line. Your environment will need to be configured for Vortex OpenSplice. Go to File -> Open and open the xml file where the RnR service has been configured. Click on the RnRService tab and you will now be able to add a storage. Right click on the RnRService and choose Add > Storage. The XML storage should now appear in the configurator tool. By default the filename is rnr-storage.dat. If you want to change this you can click in the filename value box and add your own name. The filename may contain a relative or absolute path. If the path is omitted the files are created in the current working directory. When you have finished with the configuration save your file. 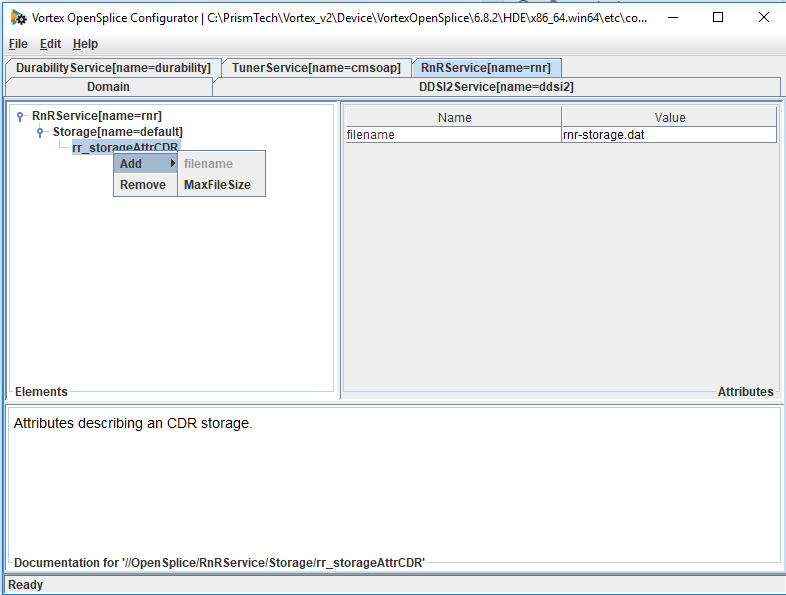 To add CDR storage right click on the RnRService and choose Add > Storage. This will add a default storage. Right click on the default storage and choose Add -> rr_storageAttrCDR. This will add the CDR storage. By default the storage is named rnr-storge.dat. You can change this name by clicking in the value box and adding the name you want. The filename may contain a relative or absolute path. If the path is omitted the files are created in the current working directory. 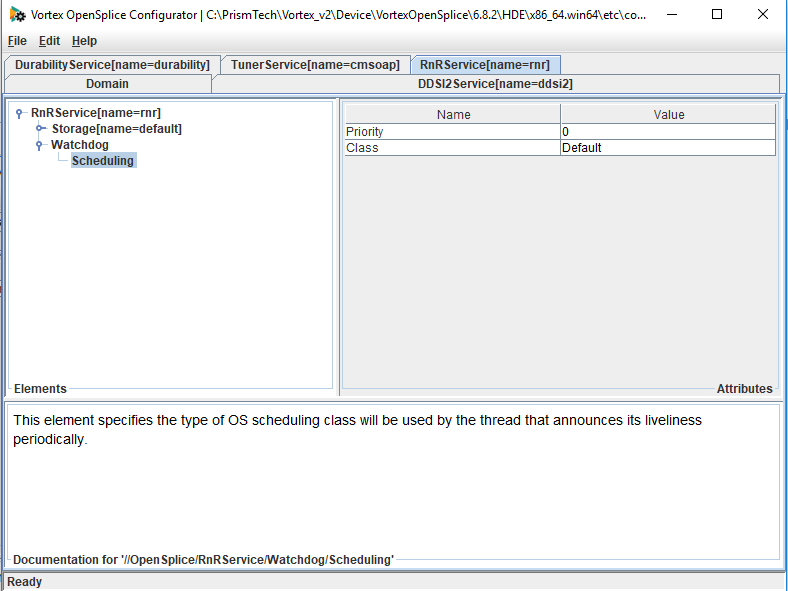 The details of the configuration options for the RnR service are explained in full in the OpenSplice Deployment manual. Both the xml storage and CDR storage have a MaxFileSize option. This sets the maximum size per storage file. During recording, if a file reaches the MaxFileSize, a new file is created. This will have a sequence number appended to the filename. The active file is switched transparently whilst replaying a storage made up of multiple data files. By default this value is not set. The filesize is not monitored by the service and will be limited only by the filesystem and platform specific limits. This will add the MaxFileSize into the storage. It will have a value of zero. To edit this click in the value box and add the value you want to configure. If statistics are enabled then the Record and Replay service will maintain runtime statistics regarding the data that is recorded to and replayed from a storage. These statistics can be published in the rr_storageStatistics topic. 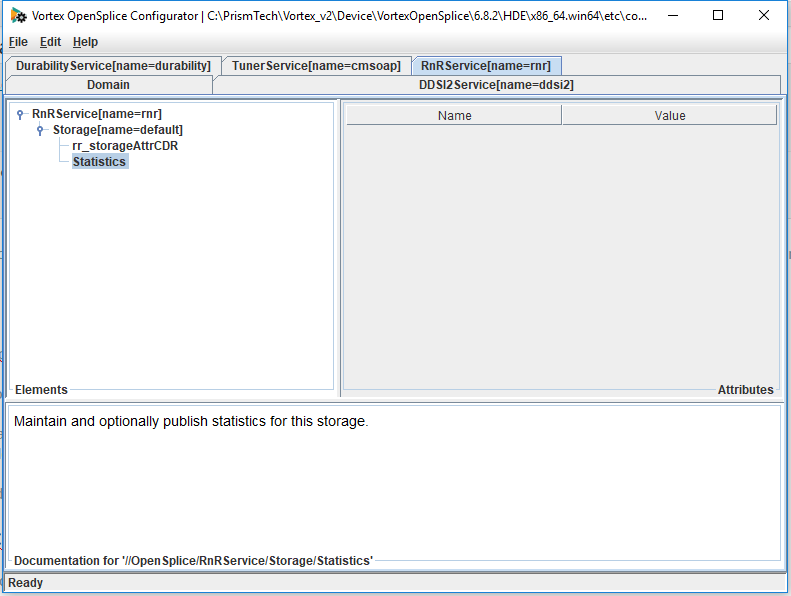 To enable statistics using the OpenSplice configuration editor right click on the storage and choose add -> Statistics. enabled – this specifies if statistics are maintained for this storage or not. By default this is set to true. publish_interval – this specifies how often statistics are published in the storage-statistics topic. The value is set in seconds. If it is set to 0 statistics will not be published. If it is set to -1 statistics are published when the storage is shut down. reset – this allows you to reset the current values of the statistics in the storage. This only works for an existing storage as new storages always start with empty statistics. Every Vortex OpenSplice service needs to let the OpenSplice deamon know that it is alive by announcing its liveliness periodically. If the service becomes unresponsive the OpenSplice daemon can take corrective measures. This monitoring is done by the watchdog thread. Scheduling – this specifies the type of OS scheduling class will be used by the thread that announces its liveliness periodically. special privileges from the underlying operating system to be able to assign some of the privileged priorities. 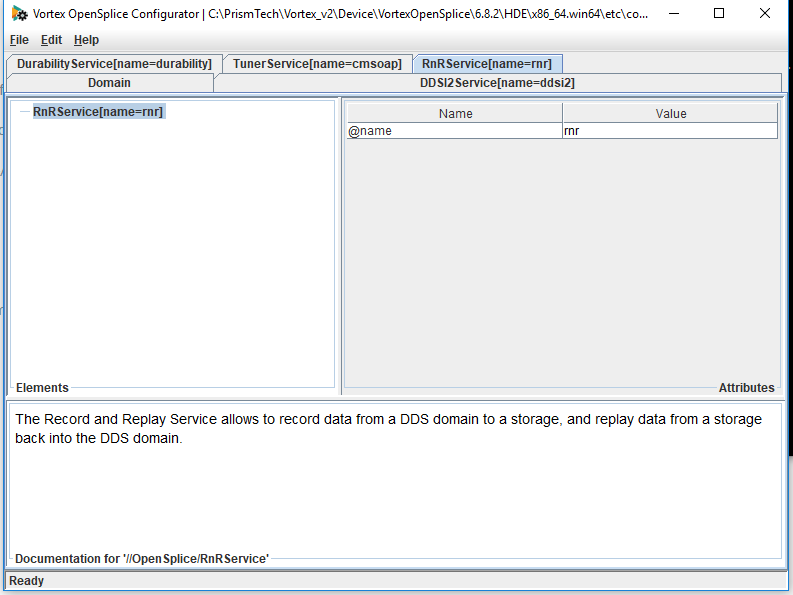 To add the watchdog thread using the opensplice configuration tool go to the RnRService tag. Right click on the RnRService name and choose add Watchdog. Don’t forget to save the xml file. To change the scheduling and priority of the watchdog thread click on the little button beside the watchdog thread. This will open up the scheduling option. If you click on this you will see the Priority and Class on the right hand pane. To change these values just click in the box beside them. 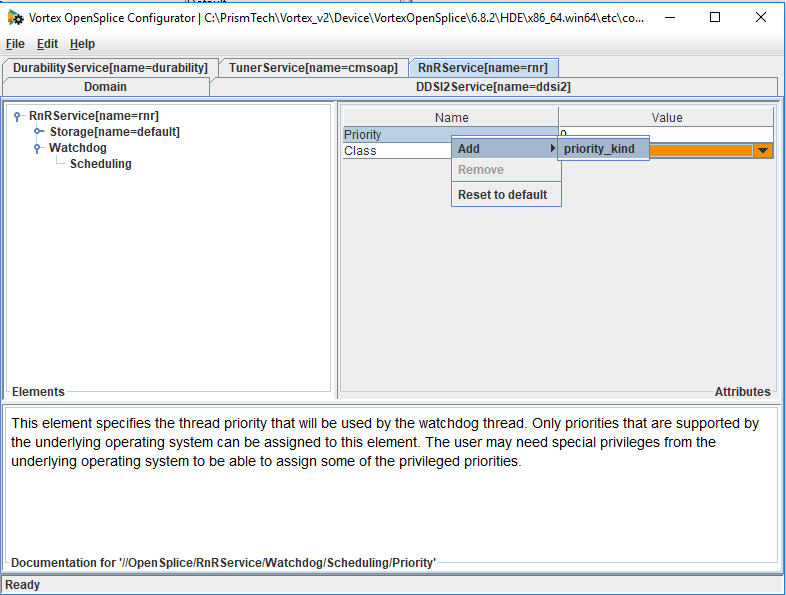 Priority also has a subconfiguration option of priority_kind which specifies if the priority is a relative or absolute priority. To add this right click on Priority and choose Add > priority_kind. This will be added into the right hand pane and you can click on the value box to change it. Occasionally you may run into problems when using the RnR service. 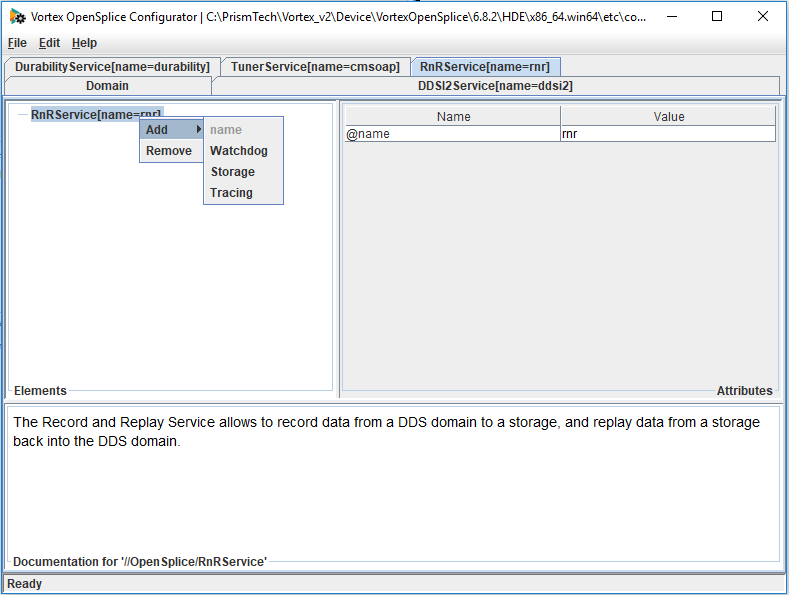 In these cases it is helpful to enable debug logging which will show you what is going on inside the RnR Service. To do this you need to enable the Tracing element in the xml file. 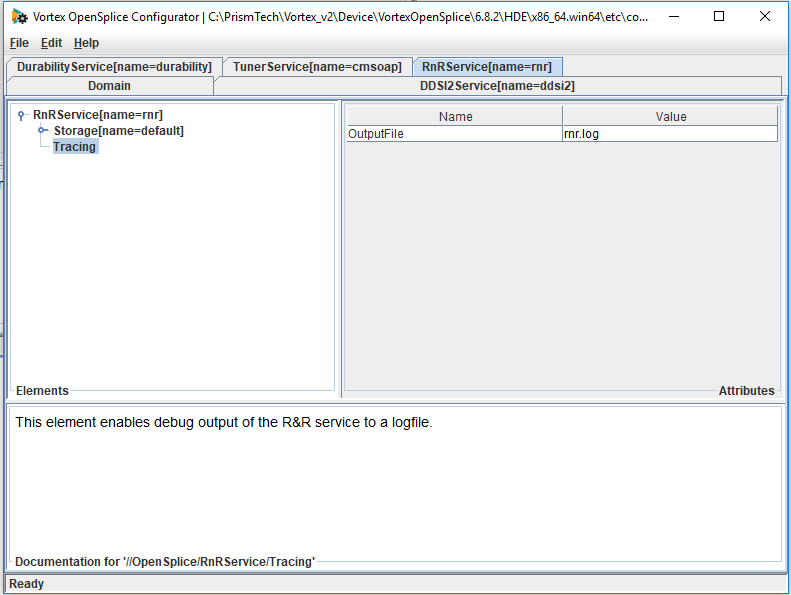 Using the Vortex OpenSplice configuration tool go to the RnRService tab. 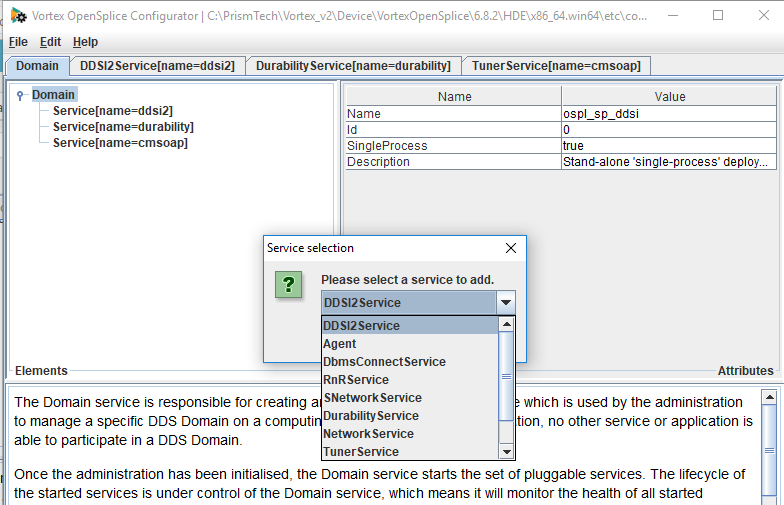 Right click on the RnRService name in the left hand pane and choose Add -> Tracing. This will enable RnR logging. The tracing element will be visible in the left hand pane and the logging will be put into the file specified by the OutputFile option. The default value is rnr.log. You can change this name by typing in the value box. The value “stdout” can be used to send the output to “standard out” and “stderr” will send the output to “standard error”. AppendToFile – This option specifies whether the output is appended to an existing log file. The default is to overwrite the log file if it exists. • FATAL: Errors that are potentially fatal for the correct operation of the service. • WARNING: Warnings that indicate for example incorrect or unsupported usage of the service. • INFO: Descriptive messages, logged when certain important events occur. • CONFIG: Events related to the service configuration. • TRACE: Detailed messages describing the behaviour of the service. • RECORD: Messages for each recorded sample. • REPLAY: Messages for each replayed sample. To use the RnR Service you can use the RnR API to record and replay data. More information on this can be found in the RnR API Guide which is part of the Vortex OpenSplice documentation bundle. You may also wish to download the Vortex OpenSplice Record and Replay Manager which is a tool to control the Vortex OpenSplice Record and Replay Service and to inspect and change recorded data.